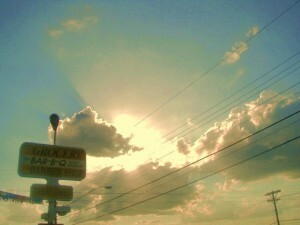 I’ve had a long love affair with Willie’s Barbecue located way out MLK in far east Austin, Texas. I first started going there back in the 90s when word on the street had it that Willie was offering boudin with his brisket. I’m an ardent lover of boudin and regularly make a near 800 mile round trip from Austin to the prairies of western Louisiana to buy the best in the world at the meat markets around Lafayette. I asked owner Willie Showels how he cooked his boudin on my first visit and he responded “oh, when the brisket’s about done I just drape the links over the meat and let them smoke for awhile”, he said it as casually as a man might ask for a few more ice cubes in his sweet tea but the words had a profound affect on me. Smoking boudin is the only way to eat boudin. Here’s a hot link to more info on Willie’s Barbecue. You haven’t lived til you’ve had a slab of brisket hot off Willie’s pit with a link of boudin as a side dish. This entry was posted in Texas Barbecue, Texas Barbecue Photos and tagged barbecue, BBQ, best barbecue, Brisket, central Texas hot guts, east austin, Pork Ribs, Restaurant. Bookmark the permalink.